Sometimes I feel like that the Ducati Multistrada 1200 S will never settle into a final configuration for me. Like never, ever. Not because it's so far from from what I want it to be, but because it is so close to perfect that I cannot help but try to 'improve' it. So here goes some more updating, try not to get cross-eyed. What? Really? But there's method in my madness. 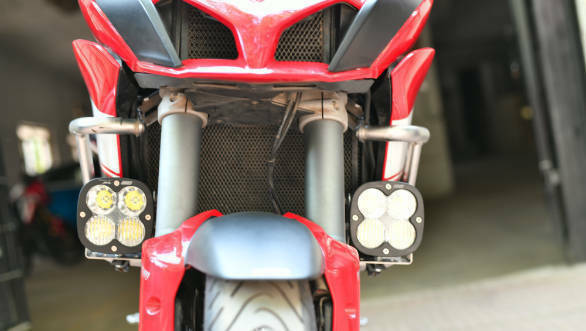 I found these enormous lights from Baja Designs that, it turns out, are lighter and brighter than all four of the lights on the Ducati. To me that means less wiring, fewer switches and still more confidence early in the morning. So I pulled the trigger on the XL80s. And they're all that - watch for a produce review shortly. But surprise, that's all I've added to the bike so far. I intend to review the tyres separately so I won't go too deep into the Metzeler Roadtec 01s. I've got about 600km on them so far and they're very likeable. They have the same stiff-carcass feel that I rather enjoyed on the M5 Interacts you get on the KTMs. 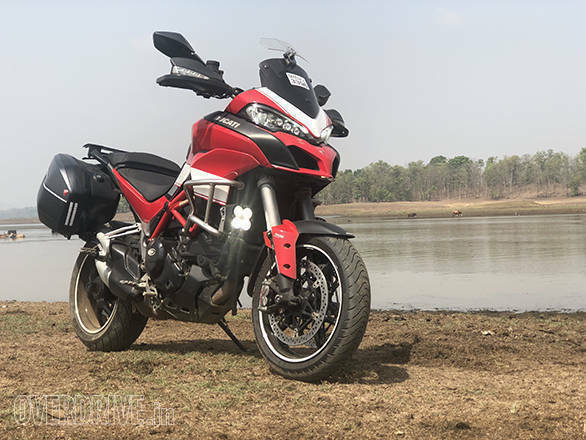 Grip is very good and while it isn't fair to compare these with an end-of-life tyre, riding with a generous throttle opening in Mumbai isn't so much like a firework display from the Ducati's dash any more. The few slides I have provoked, though, have felt amazingly controllable. The boys and I have been out riding roads around Mumbai and in the process found that the Ducati manages the pillion and luggage rotation quite happily. The Ducati panniers make life extremely easy, swallowing a lot of gear and needing only a touch of the preload button to allow the bike to feel as light and accurate as ever. Shower floor grip tape makes a mean (and cheap) grip pad - they're so cheap on Ali Express. Zubinn Design's skilled hands makes them look good too! Our art director, Balvir and I happily rode a 300km stretch and I don't believe either of is were particularly uncomfortable by the feel, distance or length of the ride. But more importantly, the rides have thrown the Ducati onto a selection of unknown roads and I've bashed it through bad roads as well as dirt trails too - on the road tyres, yes. What I've discovered is that the Multistrada is rattly. The rear footpegs, 18,000km old mirrors and the chain slapping the swingarm are the primary culprits and they're all pretty vocal. Sounds nasty, I promise you as you handle the rough. But three things stand out. First, within the limits of the tyres and the suspension, the Ducati actually does reasonably well for itself. It feels comfortable and not entirely out of its depth. Second, standing up requires you to lean a bit too far forward because there is no other place to lock your lower legs securely - this gets uncomfortable rapidly. And third, much to my relief, the rattling subsides to a level I can live with once we return to good roads and battered urbana. Phew. Since the heat of the Ducati seems to play badly with the heat-activated glues that power most grip pads, I've abandoned that direction of creating more grip on the Ducati. The AdvRider forum pointed out that many people were using PEVA or shower floor grip foam tape to achieve similar but more durable results. And these tapes - 2 inch wide rolls in grey, black and clear - are priced at Rs 600 onwards on AliExpress. So I tried them. The glue still cannot handle the superhot pivot plate but the tank and side panel grip challenge as been met. The panels get filthy but the grime washes off. Sorted! 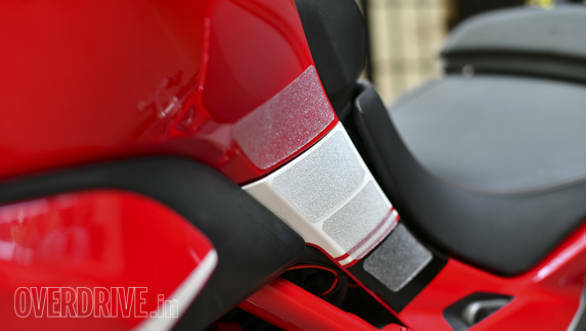 new Ducati Multistrada 1260 is about to launch. Good time to leave the fleet, maybe?